Why 1:4 is considered as cost price rather than profit ratio? A person bought 2 refrigerators for a total of 42000. He sold one at a profit of 20% and the other at a profit of 30%. If his overall profit on selling both the refrigerators is 28%, then what is the selling price of the refrigerator, which was sold at a profit of 30%? In the diagram, we used profit percentages only so why 1:4 is considered as cost price ratio rather than profit ratio? Last edited by Ganesh Ujwal; April 13th, 2018 at 11:25 PM. The profit percentages are percentages of corresponding cost prices, so 1:4 is the cost price ratio. 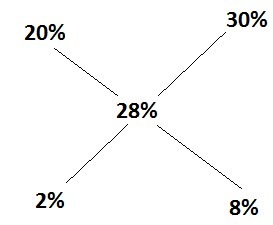 If you proceed similarly using percentages of the corresponding selling prices, the ratio you use will be the selling price ratio.